Do you have videos on VHS tapes or DVDs that you would like to post on YouTube or Google Video ? You can send the videotapes or DVD disks by snail mail to youby.com and their engineers will convert & upload your videos to Youtube website. Your master video will be returned to you in 30 days with a complimentary DVD copy. All this for $99. And if that sounds too much money for just uploading those DVD videos to Youtube, here's how to do it for $0. We'll use an open source software called HandBrake that's available for Mac, Windows and Linux platforms. 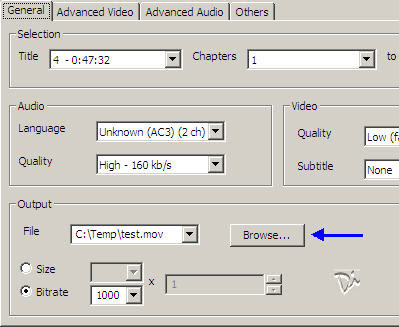 Hand Brake software can convert DVD videos to MPEG4 (MOV, MP4) compatible video files in few clicks. These converted video files can directly be uploaded to Youtube just like WMV or Windows AVI files. First insert the DVD disc and select the VIDEO_TS folder of the DVD drive that houses the VOB movie files. Switch to the Advanced Video tab and choose x264 as the Codec. Click next to start the conversion process. Now your DVD video is ready to get uploaded on Youtube or can be transferred to your Video iPod. Update: Execute the wxHB.exe file in the unzip folder to start Handbrake on Windows.